"All This Because of One Lousy Book!" COMICS! Sometimes I Let The Sunshine In! I’ve liked Michael T. Gilbert’s work ever since I noticed his inks energising P. Craig Russell’s Elric for Pacific back in (Ack! The years, they fly like the leaves!) 1982(?). There his enthusiastic disorder prevented Russell’s work from resembling too strongly the statuary it can often ossify into. When Russell departed to be awesome elsewhere Michael T. Gilbert carried on the series for First! with George Freeman; together they produced line work as seemingly casual as silk in the wind but in fact each silky line was tethered securely to a stout tree of storytelling chops. 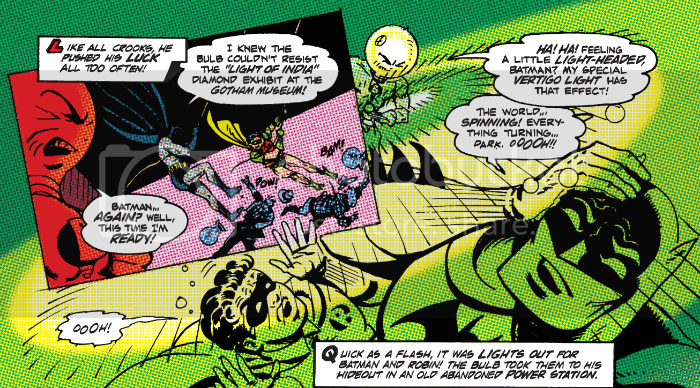 No, wait - Gilbert & Freeman brought just the right balance of Order and Chaos to Elric. Good stuff; certainly good enough stuff to be slated for a series of Titan reprints starting in 2015 (Hoo-HA!). But Michael T. Gilbert made his real mark on comics with Mr. Monster, a Golden Age obscurity resurrected as a tender comedy-horror tribute to all that was trashy, camp and old. Mr. Monster recently appeared in a number of issues of Dark Horse Presents which made me glad all over. Mostly I was covered in glad because the thing I like best about Michael T. Gilbert was still there; his energy. And in the following comic his energy is in full effect. Yes, yes, basically, I’m going to tell you about some old crap I found because you can’t stop me. (Cackles maniacally.) By the time 2015 rolls ‘round you’ll all love Michael T. Gilbert as much as I do! Lovably enough "Stories" is literally a story about stories, and these stories are told by a group of people stuck in a lift on the 13th story of a building. You can see already that Michael T. Gilbert has already carried his conceit way too far for serious pipe smoking consideration, which is good as his work here eagerly spurns solemnity and dances the lambada with lunacy. The set-up is that a guy who wrote a book about some religious extremists is trapped in a lift with a few other people. They are all unawares that the impromptu stop is man-made and that the cause is on its way up the stairs to demonstrate the Love of God by machine gunning the author to death. It’s good the stalled folk don’t know that because just being stuck in a lift is enough to make the author come unstuck; everyone else trusts Batman will save them but, pointedly, the panicking author doesn’t believe in Batman. Everyone rallies round and tells him a Legend of The Dark Knight to keep his pecker up. All that, though, is just there to shore up Michael T. Gilbert’s manic and lopsided gallop through the history of Batman. It’s a lot of fun is what I’m getting at from hereonin. First up is an elderly dame claiming to be Julie Madison whose insane ramblings are entirely Golden Age in their overwrought and energetic appropriation of the most sensational aspects of pop culture. In the space of four pages there are werewolves and vampires and robed maniacs and gorilla wrasslin'and gorilla strangling and The Bat-Man enthusiastically shooting people in the head and all while rationality rings in, rolls over, and takes a duvet day. It’s pretty crazy stuff but I don’t think even Michael T. Gilbert’s frothing dog approach makes it much crazier than the actual Detective Comics #31 (1939). There’s just so much crazy in any Golden Age tale that any more is just a case of straitjackets to bedlam. A cop then waves things down and launches into a story ("The Bulb Boss of Gotham City!") set after Batman has dropped the definite article and teamed up with a young boy dressed like the female lead in a panto. Oh, and they are scrapping a guy with a giant light bulb on his head who nabs things like implausibly valuable tulip bulbs. This is as absurd as the Golden Age tale but in a more sedately charming way. Next up in "Age is Unhealthy to Children and Other Living Things!" some hippie with a brain fried like bacon yammers on in a Denny O’Neil & Neal Adams’ “Damn The Man!” vein and it’s another layer of humour how Good Michael T Gilbert is at evoking Neal Adams’ signature Hysterical Realism©®. This one was my personal highlight because while I laud and appreciate O’Neil & Adams’ Relevance NOW! stuff, let’s face it, it's not aged any better than the stuff where Batman dressed as a zebra and fought dinosaur clowns on the planet Cher. Throughout none of the humour is mean-spirited or patronising; Michael T. Gilbert clearly loves this stuff, but he also knows you can laugh at something and still love it. 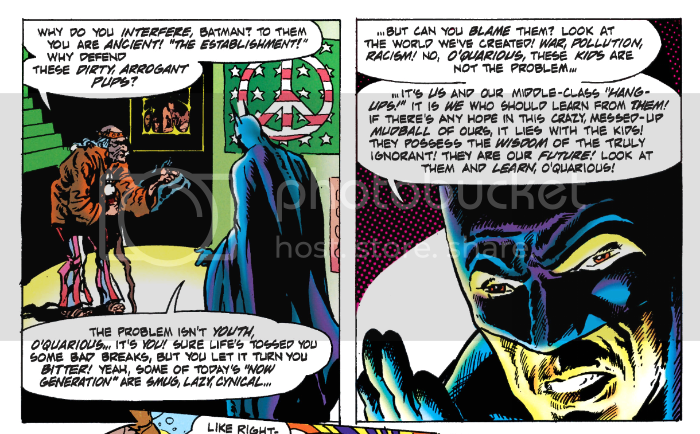 Although I think his patience is thinner with the ‘90s Exxxtreme Killer Batman as he only spends a couple of pages with that iteration as though in recognition that that stuff mocks itself just by existing. While it clearly makes not a lick of sense for someone in a Batman comic not to believe in Batman it works in this Batman comic. That’s because “Stories” isn’t intending at any point to flirt with realism. 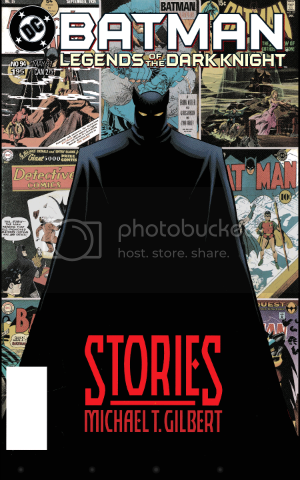 “Stories” is a story about stories; a story about Batman and how he changes with the times; a story about faith and blindness; mostly though “Stories” is the type of story that if Neil Gaiman had written it, it would be anointed as post-modern, as meta-textual, any inconsistencies would be due to magical realism and everyone with a mortgage could feel a lot better about reading Batman comics. Actually, hang on, Neil Gaiman did write this, as "Whatever Happened to the Caped Crusader?" and it was a foppish porridge of constipated whimsy with perhaps the most precious ending in comics’ history. Sure, before "Stories" ends you’ll already know the exact words it is implacably intent on finishing with and while, yes, that is predictable it is also satisfying, as everything clicks into place with the final period. But any sense of neatness is illusory. "Stories" is loose and messy and ultimately refuses to be tied to a single interpretation. It may look like a crazed babble of yelping tomfoolery but, okay, it is, but under all that "Stories” is still serious and seriously GOOD! Soberingly, I suddenly realised that they've been around longer than any of us - COMICS!! !